This is one of my favorite plays right now. Note: LG Panel (LPL) makes the display panels for LCD TVs (and other devices), it is not LG Electronics the electronics manufacturer. Fundamentally passive display 3DTV panels are gaining huge acceptance over the active types that were originally introduced 1-2 years ago. LG Panel supplies the passive panels to LG and Vizio. According to a recent study, 8 out of 10 consumers prefer passive over active and sales of passive 3DTVs are growing faster than active. Recent Black Friday #'s suggest continued strong sales of 3DTVs. Recent estimates have been raised and now call for over 22 million 3DTVs to be sold this year with that number rising to 100 million in 2014. Recent 3D hits like Hugo (by Martin Scorsese) are also driving renewed interest in the sector as a whole. 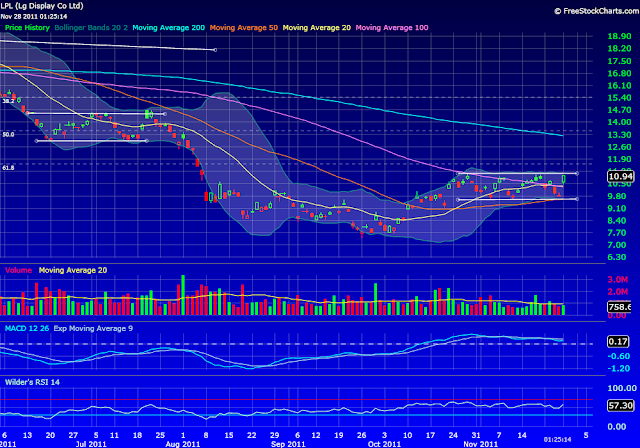 Technically LG Panel's chart looks really strong, consolidating between 9.60 and 11.2, above its 50 day moving average. 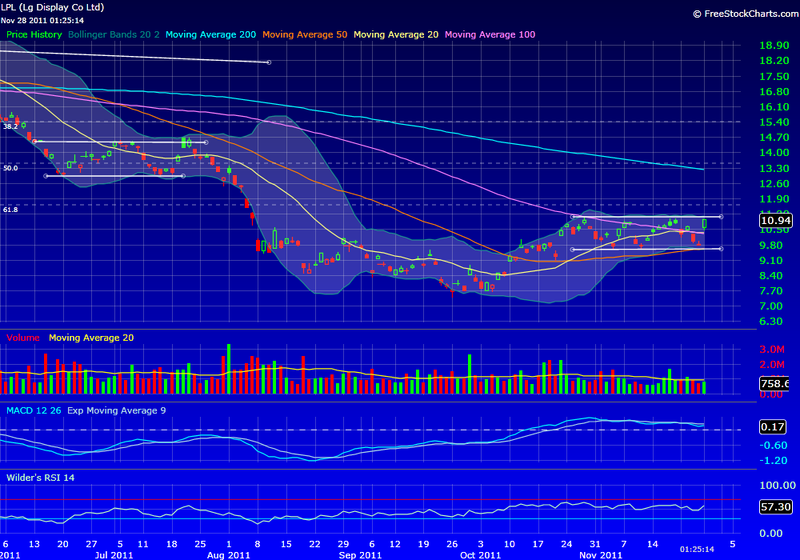 Look for a break above 11.10 to add to long positions for a test of the 200 day moving average currently @ 13.20.